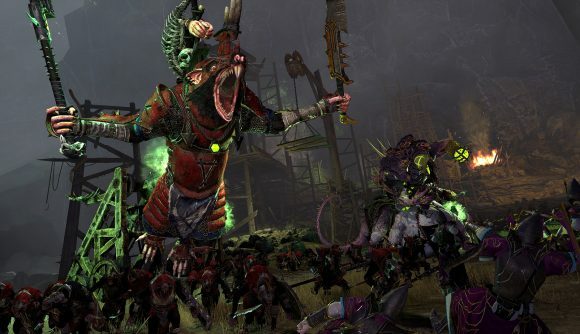 As Total War fantasy fans have been speculating for the better part of a year, it seems that Warhammer II’s next bit of DLC is set to be the Lizardmen and Skaven Lords pack. Creative Assembly’s latest set of hints appear to confirm the theme of the new pack, but notes that it won’t be available until after the Total War: Three Kingdoms release date. As per CA’s usual not-so-subtle method of hinting, “scheme and plot beneath the surface” probably means Skaven, and “cold-blooded” certainly points toward some reptilian Lizardmen. Even if we hadn’t been expecting them for the past year, the tease doesn’t leave much room for alternate interpretations. Three Kingdoms will be out in March, so we’ll be approaching a full year since the release of The Queen & The Crone Lords pack in May. If tradition holds, you’ll have a pair of new lords, a bunch of new units, and accompanying quests, campaign mechanics, and items. The real question is how much more Total Warhammer II we’re going to get. Total War: Warhammer 3 entered pre-production sometime last year, and little over a year separated the launch of the previous two games. That means we’re already overdue for Warhammer III. But there’s no shortage of Total War content coming down the pipe, regardless of which flavour you’re looking for.